Marvel has been a become a big presence at Disney’s California Adventure which is so exciting for Marvel fans. And now with the announcement of a Marvel themed Super Hero Land this presence is going to become even more predominant. To help us get hyped (or count the days!) until this Marvel themed land gets put into place, we’ve put together a guide for everything Marvel currently at Disney’s California Adventure park. Marvel Themed Super Hero Land to Arrive in 2020! This is the main event- it can’t be missed for any die hard Marvel fans! Make sure you arrive at the parks early and be ready to snag your FastPass for the main Marvel attraction at Disney’s California Adventure. Guardians of the Galaxy- Mission: BREAKOUT! Rocket is on a thrilling mission to rescue the Guardians from the Collector’s fortress and you’re along for the ride! This attraction, converted from the Tower of Terror, has quickly become a guest favorite with FastPasses running out by the afternoon. Make sure to grab your FastPass early so you don’t miss your chance to see one of Disney’s newest attractions! Make sure to check out our extensive guide on FastPasses if you are new to the parks! You can find this awesome dance party in front of the Guardians of the Galaxy-Mission: BREAKOUT! attraction. The nice thing about this character interaction is it always has consistent times listed on the app and the Disney website since it’s considered a show. Star-Lord, Groot, and Gamora lead a dance party and everyone is welcome to join! Kids love this interaction so don’t miss it if you have little Marvel fans! Make sure to stick around to meet Groot after the dance off! This summer at California Adventure has brought even MORE Marvel characters which has been super exciting for fans. We have tracked down every character and a rough estimation of their appearance locations and times. As always, we recommend you download the Disneyland app to help you track character times and appearances! Spider Man & Captain America are currently meeting park visitors in rotating schedules at the Brownstone Building in Hollywood Land. Check the park app for the most current daily times. These are the two most reliable character meet and greets with at least one of these characters occupying this space throughout the day and evening. Black Panther, his royal guard the Dora Milaje, and Black Widow are currently meeting park visitors to the left of the Monsters Inc ride in Hollywood Land. Their appearance times are often listed on the app or on the Disney website. Don’t miss out on the King of Wakanda and the coolest secret agent (ever) on your visit! To the delight of many Marvel fans, Dr. Strange will be greeting park visitors for a limited time this summer at California Adventure. Make sure to keep your eyes on the Disneyland app to catch a glimpse of the Master of Mystic Arts for the most accurate times. You can find him in Hollywood Land in California Adventure. You can find Groot typically after the Guardians of the Galaxy: Awesome Dance Off to do meet and greets. Don’t ask poor Groot to try and sign your autograph book- those hands aren’t meant for holding pens! Groot sometimes appears at other random times throughout the day so keep an eye out for him! Thor and Gamora are one of our wandering character experiences with no set schedule. If you see them, be sure to follow them to see if you can get a chance for a meet and greet! You can find them wandering around Hollywood Land. Keep an eye on the Disneyland app to find this fantastic duo! Our favorite trickster can also be found wandering around at random in Hollywood Land. Keep your eyes peeled for this mischievous villain and fan favorite. These wandering characters tend to interact with kids dressed like them (like the recent viral video of Loki and the little girl at California Adventure) so make sure your kids are in costume if they’re fans! As always, keep your eyes on the Disneyland app for Loki! Guests can now meet Captain Marvel in Hollywood Land in her permanent meeting location at S.H.I.E.L.D. Hangar 12. 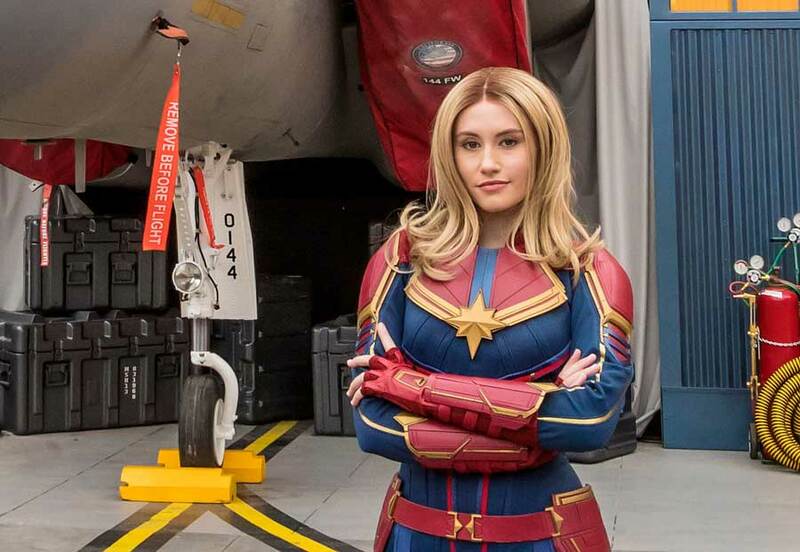 She is here to stay to help inspire guests to go Higher, Further, Faster as they pose with this awesome super-heroine in front of her jet fighter. You can fairly easy track down Marvel merchandise throughout the parks but there is one go to spot for ALL things Marvel. You can find this Marvel themed store on the ground floor of the Guardians of the Galaxy- Mission: BREAKOUT! attraction. They have attraction themed souvenirs so you can show off your bravery for taking on this thrilling ride. This store also offers t-shirts, comic books, collectibles, DVDS, and plenty more Marvel merchandise for any dedicated fan. Last summer during the Summer of Heroes we got a bit spoiled with plenty of Marvel food options. But never fear! There are still a few to be found hanging around the parks. And there will be sure to be more on the way as Disney gets closer to developing their Marvel themed land. The craze about this cup has been insane! Keep your eyes peeled for this one- every time it shows up in the parks the lines get crazy long and they sell out quick! You can find them sporadically at vendor carts around Hollywood Land and other areas of Disney’s California Adventure. They’re currently selling on eBay for over $80 a pop if you can’t seem to get your hands on this ultimate taste of power in the parks. This was a seasonal offering during last summer’s Summer of Heroes at California Adventure but it is still offered at Schmoozie’s! This drink comes with a glow cube and costs around $7.50. You can find Schmoozie’s in Hollywood Land. You can find this delicious pile of sugar at Marceline’s Confectionery in Downtown Disney. It’s almost too beautiful to eat! Almost. We said goodbye to Bugs Land in summer of 2018 so construction could begin on the new expansion of the Marvel themed land in California Adventure. We will keep updating this guide as we hear more about this new Marvel area! Next Post: 8 Must-Sees When Doing Disneyland For Adults!